Though the Octavia is known for its space, price and value sensibilities, its sporty side has a strong following in the UK. 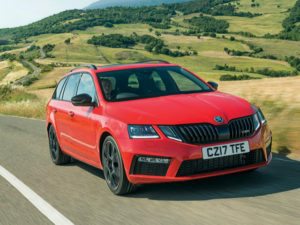 This is Skoda’s biggest market for the vRS line-up, and a fifth of Octavias wear the badge. That half of those go into fleets reflects a strong user-chooser offering, too. There’s plenty of choice; estate and hatchback versions, both retaining all of the standard car’s people and load-carrying capability, but adding aggressive body styling, large wheels and heavily-bolstered sports seats. With the more sophisticated of the Octavia’s two rear suspension setups fitted to all versions, it’ll take you wherever you need to go in comfort, then encourage you to take the long route home at the end of the day. Both 2.0-litre turbocharged petrol engines are new. The entry-level version now produces 228bhp, instead of 218hp, and there’s a 242bhp model at the top of the range. That’s a lot of car for just over £30,000, and Volkswagen Group petrol engines are reasonably frugal too, but CO2 emissions between 146 and 150g/km make them a stretch as a company car. Unsurprisingly, three quarters of UK customers (even higher in fleet) opt for the 182bhp 2.0-litre TDI. It’s slower on paper, but with plenty of mid-rev punch to keep it entertaining and slightly more engine noise. It’s also significantly more efficient in manual form, though there’s a sizeable 10g/km CO2 penalty to opt for DSG and another 5g/km to add if opting for the four-wheel drive version. However, with a little toggling of driving modes, even the 4×4 can return 50mpg at motorway speeds. Best of all, it’s still an Octavia underneath; cheaper than most direct rivals, more spacious inside and with that overall feeling of solid, long-lasting quality. All good factors for a continuing popularity in the hot hatch-loving UK market.